Let’s have a look at our technical analysis updates for the BSE Sensex over the last couple of months. BSE Sensex is a stock market index for Mumbai, India, and it is one of the stock market indices we analyze 1-2 times per week. Here’s a chart with some of our analysis comments spliced in. Please note that we’ve masked some information, and that this chart doesn’t contain any Elliott Wave Theory markup, and none of our indicators. Click the chart to open a full-size version of it. Please note that our updates for most of February 2017 are not included in this summary. Back in November of 2016, our methodology strongly suggested that the BSE Sensex would be in a quite irregular trading environment for the next half-year to a year, at least, and that large price swings between 23500 and 28000 could be expected. At that time, wave structure was very unpredictable, but it did suggest an irregular trading environment, and not a strong downtrend. As it turned out, the BSE Sensex never reached the lower end of the range we suggested, but instead proceeded to create an interesting sideways structure next, and has then rallied. Anyways, on the 5th of January of 2017, the BSE Sensex had created a very interesting set of conditions, suggesting that a breakout towards 28000 was probable if the index could break a particular trendline (not shown in this chart), but that there was some resistance just ahead (a composite resistance level), which could be strong enough to stop the advance. As it turned out, the resistance cluster only managed to stop the BSE Sensex a couple of days, before it broke through and activated our buy signal and target of 28000. The 28000 target was then reached on the 1st of February 2017. On the 2nd of February, our analysis suggested a top of some degree was imminent, and at that time, we speculated that the entire advance would actually potentially be over, and specified certain critical levels on the downside that had to be taken out. Now, as it turned out, the BSE Sensex did start a minor correction not long afterwards, but it turned out to only be a sideways formation, and the index has continued higher since. None of our critical sell signals which were needed to confirm a top were triggered. In November 2016, we were correct in our wave analysis suggesting that the BSE Sensex was not in a downtrend, but rather in a large-scale sideways correction. It didn’t, however, touch the bottom of the range we suggested at that time. In January 2017, we alerted our subscribers to a certain set of conditions, including a potential buy signal, which then led to an advance of approximately +5%. This represents an annualized gain of approximately +60%. In early February 2017, we were too early in calling for the entire uptrend to be over, only a minor sideways correction ensued. 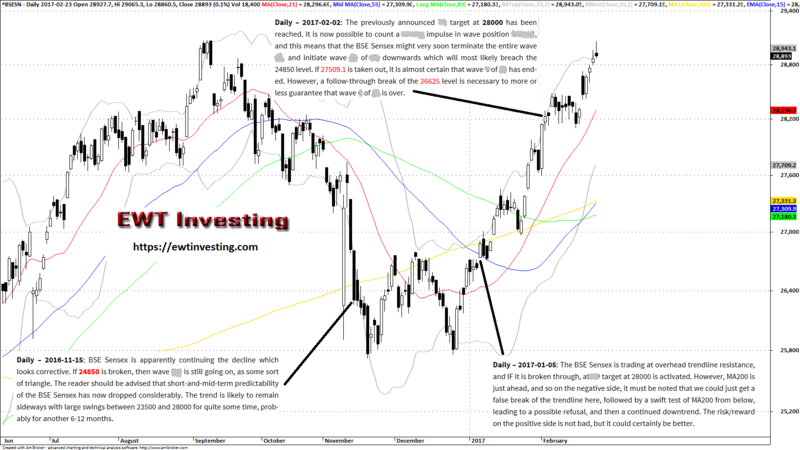 All in all, a decent series of analysis updates on the BSE Sensex. We got the general type of market behaviour correct back in November, and more or less locked in a move of approximately +5% in a month from early January to early February 2017, which translates to annualized gains of approximately +60%. It could have been worse, and it could have been better.